What you need to know about Trillian is that it will work on any Windows-based operating system, and if you go for the basic version you will not have to pay in order to use this product. Trillian Pro on the other hand will set you back about $25. For this amount of money you don’t only get the Trillian Pro software, you also get a one year’s subscription to tech support, upgrade protection, software patches, and the chance to chat in Member Only forums. There are other features in Trillian that must be noted, besides the fact that it will let you access several IM accounts. You have things like group and audio chat, chat rooms, customizable skins, buddy icons, data transfers, and a few more. If you would like to video chat, you must get Trillian Pro since this feature is not available in Trillian Basic. With version 3.1.12.0 of the Trillian software, Cerulean has fixed some security and compatibility issues. “This version addresses 3 recently reported security vulnerabilies and includes a minor fix for the MSN engine that was causing crashes for a small number of customers,” says the official Cerulean Studios blog. Cerulean Studios, the company behind Trillian 3.1.12.0 was founded a decade ago in the US state of Connecticut. Back in 1998, Kevin Kurtz and Scott Werndorfer got $10,000 and their ingenious minds together, started the company and released Trillian v. 1.0 just two years later. It must be noted that in the beginning the two had to develop the software based on user donations and their own savings. 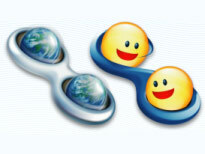 If you would like to get Trillian 3.1.12.0, a download location is available here.